Artist Damien Hirst has refused to allow one of his early works, painted directly on to wallpaper in a house in London, to be sold. The 1988 spot painting was created for the then homeowner, Jamie Ritblat, as a birthday present. When the house was later sold, the painting remained. New owner Jess Simpson, removed it and framed it. She now wants to sell it. But Hirst's company Science Ltd has said she cannot sell as they are the rightful owners. Ms Simpson told BBC Radio 4's Today programme: "Science first said you must return it for destruction. Then... they said we can display it but we can't sell it as a Damien Hirst or profit from it." 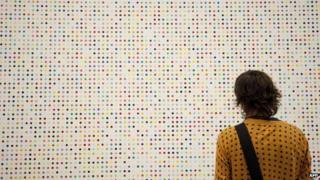 She said she had offered the painting to Sotheby's and Christie's but "you can imagine, they don't want to upset Hirst, Science, or any of their collectors". The painting, titled Bombay Mix, was bought for Mr Ritblat as a present from his parents Sir John and Lady Ritblat, who were big Hirst collectors. In a statement, Science Ltd said: "The ownership of a wall painting in the series titled Wall Spots always resides with the owner of the Wall Spots signed certificate, which accompanies the art work." They said they acquired the certificate from the original owner "a number years ago", describing the company as "the legal owner of the wall spot titled Bombay Mix". "The certificate certifies ownership. Someone being in possession of the painted wall surface without the certificate does not have any entitlement to the work. "The painting should have been painted over when the previous owner traded the wall spot for a work on canvas," it continued. Science Ltd said that using a certificate to confer ownership is "common practice" and accepted in the art world, where works of art are site-specific or painted directly on the wall. They cited the case of the American artist Sol LeWitt's numerous wall drawings as an example. The BBC's arts editor, Will Gompertz, told Today: "This was painted in 1989, six months after he had his famous Freeze show, his spot paintings were there - if I were Jess I'd have left it on the wall as a piece of art history. Its real value, culturally as well as financial, was in that spot." But Ms Simpson said she felt she had rescued it by removing it as they were renting the house out and "it was in a sorry state".